Welcome to Siem Reap Angkor, step back in the time to discover the glory of the Ancient Khmer Empire and be greeted with the best hospitality in town. 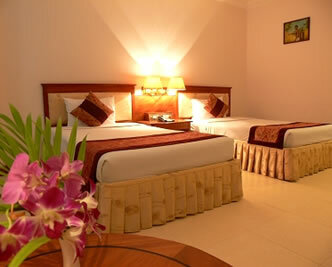 Angkor Holiday Hotel conveniently and perfectly situated at the heart of Siem Reap’s commercial and business districts, Angkor Holiday offers tremendously convenient access to banks, healthcare, restaurants, bars, cafes, convenience stores and shops. At Angkor Holiday, we pride ourselves on service quality of a genuinely high level and on attending to our own guests ‘ every need with courteousness and warmth. Welcome drink and cold towel plus complimentary use of the gym and pool. Angkor Holiday Hotel in larger map.